LOS ANGELES—Damien Valentine was suspended from school for the first time as a seventh-grader in South Central Los Angeles, after arguing with a math teacher who had asked him to change seats. Mr. Valentine, now a 16-year-old sophomore, said he was sent home for a day-and-a-half for "willful defiance," a term encompassing a variety of misbehavior that California schools can use as reason to remove students from the classroom. This week, the Los Angeles Unified School District—the second-largest in the nation—decided to end the practice of suspending or expelling students for "willful defiance," starting this fall. District officials said the practice disproportionately affects minority students' education and leads to more disciplinary problems for students down the line. by the district's school board "ends a policy that failed to keep our students learning or our streets safe," said district board member Nury Martinez. Still, some teachers and administrators argue those misbehaving students can disrupt learning and present dangers in class. "Willful defiance certainly has been abused," said Daniel Barnhart, a board member for United Teachers Los Angeles, the local teachers union. "But just getting rid of it isn't going to make the system work." The teachers union and the Associated Administrators of Los Angeles haven't taken an official stance on the measure, but both want to have input on how it is rolled out, according to representatives for both. The controversy highlights a brewing national debate over school expulsion and suspension policies. In the past few years, a flurry of studies have revealed that minority and special-education students are more likely than their peers to be suspended or expelled. The U.S. Department of Education has launched civil-rights investigations into at least 20 school districts over uneven discipline practices. In some of those cities, including Oakland, Calif., district officials have since overhauled their practices. In Los Angeles, the district's 640,000 K-12 students can still be suspended and expelled for serious violations like violence, theft and bullying. Willful defiance covers a range of less-serious misconduct, from swearing at teachers to refusing to follow instructions in class. California law defines offenders as students who "disrupted school activities or otherwise willfully defied the valid authority" of school staff. Critics say the language leaves too much room for interpretation, resulting in too many suspensions. A state bill that would eliminate the "willful defiance" suspensions for all California elementary schools is moving through the legislature. 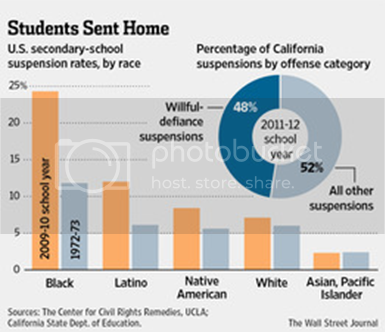 During the 2011-12 school year, willful defiance accounted for nearly half of the total suspensions in California, according to the state Department of Education. In Los Angeles, 30% of the district's 24,942 out-of-school suspensions last year were for willful defiance. In the 2009-10 school year, 22% of African-American secondary students in California were suspended one or more times, compared with 7% for white secondary students. Of all California public-school students, 7% are African-Americans and 26% are non-Hispanic whites. Policies in other states vary, but most school districts have leeway to suspend students for a wide variety of disruptive behavior. L.A. will be closely tracked to see whether fewer suspensions will have a positive impact on school safety, test scores and attendance rates—particularly for certain minority groups. Since the 1970s, the percentage of students suspended once or more during the year grew from 3.7% to 7.4% nationwide, according to researchers at the University of California, Los Angeles' Civil Rights Project. For African American students, the likelihood of suspension grew from 6% to 17%. 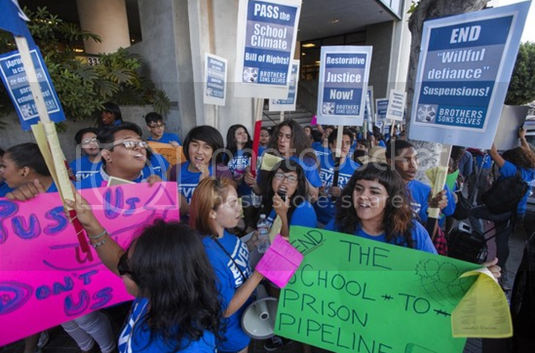 Tia Martinez, of the UCLA Civil Rights Project, a policy research center, said suspension increases a student's risk of dropping out or repeating a grade, and those kids are three times as likely to come in contact with the juvenile justice system. She said schools that work to reduce suspension rates and provide alternative discipline support to teachers are seeing higher test scores. It's time "to have the code catch up with where the evidence is," Ms. Martinez said. Speaking to school board members Tuesday, Mr. Valentine said that after his first suspension he continued to have discipline problems and was suspended five more times for more serious offenses like fighting. The adults at his school, he said, "spent a lot of time stopping my acts of defiance, but never stopped to understand why I got upset." As part of elimination of willful-defiance suspensions, L.A. teachers will be trained in alternative disciplinary methods. Fredrick Bertz, a substitute teacher in L.A., said the issue isn't cut-and-dried. Willful defiance isn't always "simple little negligible stuff," he said. "It's, 'We've got a problem and there is no way to deal with it other than removing the student.'" —Stephanie Banchero contributed to this article.